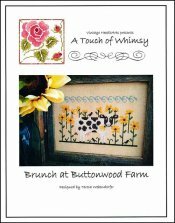 Brunch At Buttonwood Farm [D6452] - $10.00 : Yarn Tree, Your wholesale source for cross stitch supplies. A cross stitch pattern from Vintage NeedleArts. Look at this "udderly" adorable cow! The summer sun is beaming down on Buttonwood Farm as he enjoys his brunch, a flower. Don't moooove on without stitching this design! Stitch count is 116W x 68H.